Some of you might have figured out by now that I am a big fan of QUICK. I created a puff quilt pattern for the sewing machine because there was NO WAY I was going to hand stitch that quilt together. 90% of the recipes I make for dinner are something that can be whipped up in about 20 minutes or less. So frozen food? Hmm….usually that’s like ‘last minute’ convenience, because I don’t really like the taste of frozen food. No matter how gourmet they claim it tastes, it always just tastes like frozen food to me. And usually leaves me with some acid reflux issues. So I took the Make It Your Michelina’s challenge to see if I could take their frozen food, add my own special ingredients and flair, and jazz it up to be a main course. 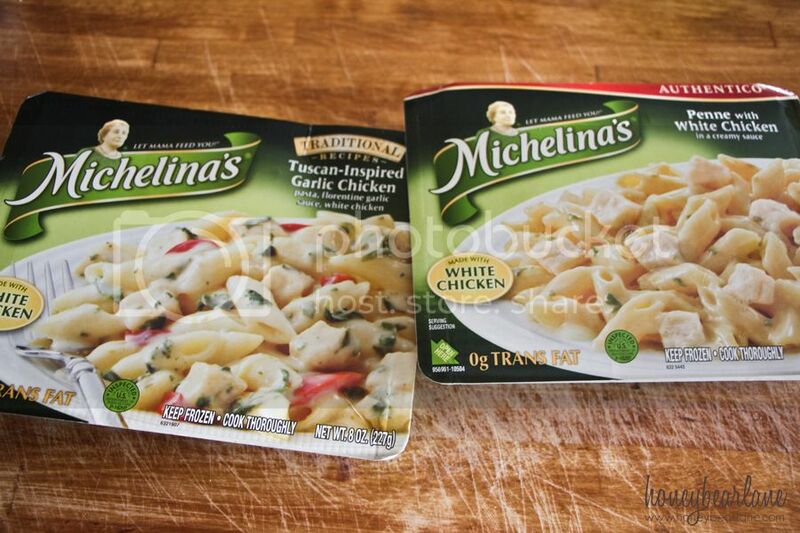 I purchased two personal Michelina’s meals: Tuscan Inspired Garlic Chicken and Penne with White Chicken. 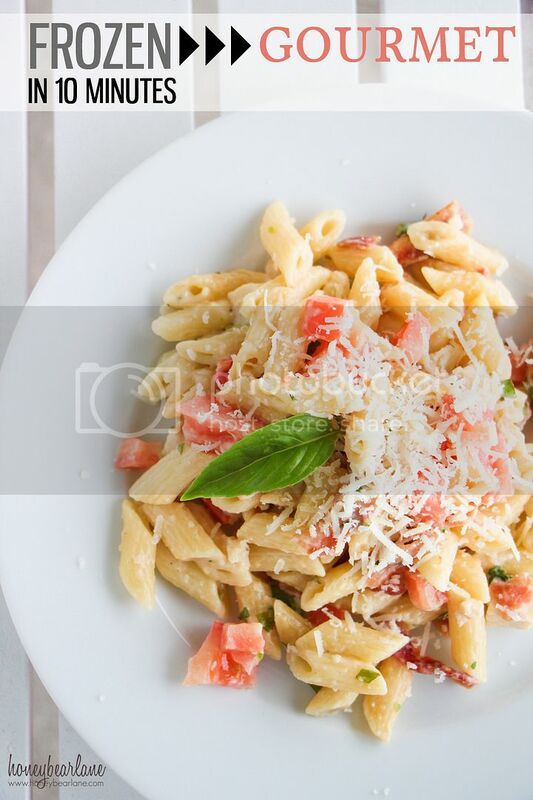 The ingredients I added are center cut bacon, fresh basil, diced Roma tomatoes, and fresh Parmesan. First I cooked the bacon in the microwave–just 6 slices on a paper towel for 5 minutes. I always buy center cut bacon because it’s much healthier than regular bacon. Three slices is only 60 calories! Then I microwaved the Michelina’s dinners (each one for 3.5 minutes.) I chopped up the basil and tomatoes, crumbled the bacon, and threw them all together in a bowl. I topped with fresh grated Parmesan. The entire meal was ready in 10 minutes. And it was enough to feed my three little kids and me. Each meal was about 300 calories, plus 120 calories for the Bacon and probably about 60 for the other stuff. So the entire meal was probably about 800 calories. And that was divided among four people (although I ate more than my kids.) Not too shabby! The best part was that it tasted great. It didn’t taste frozen because of the fresh tomatoes, basil, and bacon. 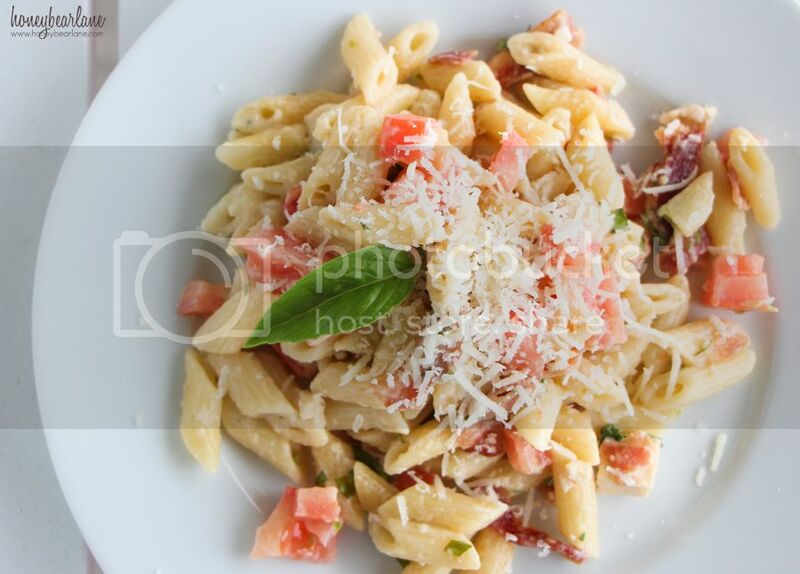 The bacon added some yummy savory saltiness and the basil and tomato added a fresh and cool texture and taste. My kids ate it all up. Michelina’s has tons and tons of different entrees that you could experiment with to make it your own. If you are like me and need quick and easy dinners, definitely consider this method! Try the Franks ‘n’ Cheese! Shut the front door!!! I’m always looking to save time cooking dinner, and I never thought of sprucing up frozen entrees like that. Thank you so much for sharing, I’m going to try this soon!